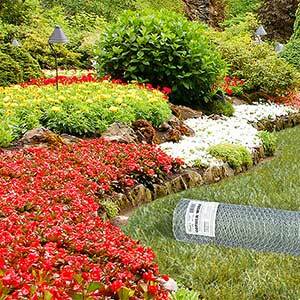 Heavy-duty gopher wire rolls help to protect your landscape and lawn from gophers as well as vole intrusion. Constructed of galvanized steel mesh, Digger's gopher wire provides up to 10 years of effective protection. View a comparison of Digger's gopher wire to other gopher wire materials on the market. Gophers are notorious for causing significant damage to landscapes and especially lawns. In a residential landscape this can be a major nuisance, on a golf green this can be a very serious and revenue impacting problem. If you have a gopher population residing in an area where you are preparing to invest money and time into landscape elements which could be damaged or destroyed by gophers it is wise to invest in a gopher barrier that will prevent mounds from appearing on your newly planted lawn, putting green or garden. Aside from natural elements, even artificial grass can be adversely effected from gophers which can actually chew through the material or attempt to burrow under which can leaves bumps and dips beneath the turf. The wire is a cost-effective and reliable way to protect both residential and commercial landscapes from gopher intrusion. It is designed to be placed beneath the lawn or planting area and is constructed of heavy-duty galvanized steel which is corrosion resistant. It is most effective when placed beneath the lawn or planting area and prohibits gophers, voles and moles from entering the landscape and causing damage. The material can be installed either vertically or horizontally. Vertical installations are usually best for protecting planting areas from gophers. In a vertical installation the material should be a minimum of 36” deep and should be placed in a trench. If connecting multiple pieces of the wire be sure to overlap the wire to ensure that there is no gap. In a horizontal installation the wire should be staked and buried 1-1.5” below the topsoil. Multiple pieces should be overlapped a minimum of 2”. Sod can then be rolled over the area. Many other methods of preventing gophers from hurting a landscape call for killing or hurting the gopher. The wire does not harm the gopher, only discourages them from entering the protected area. 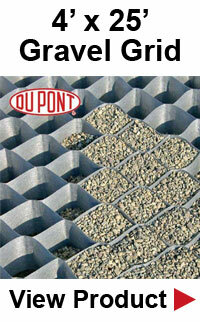 The material is available in a variety of roll widths and in a standard length of 100'. For commercial installations or where the material order total is larger than $5,000 volume discounts are available by contacting us by phone. If you have any questions regarding this material, it's application or installation please feel free to give us a call at (800) 524-4161. Are your plants and lawn being destroyed by gophers? Gopher wire can effectively protect your entire landscape from gopher intrusion. The wire is designed to protect planting areas such as planter boxes, raised beds, garden areas and lawns. 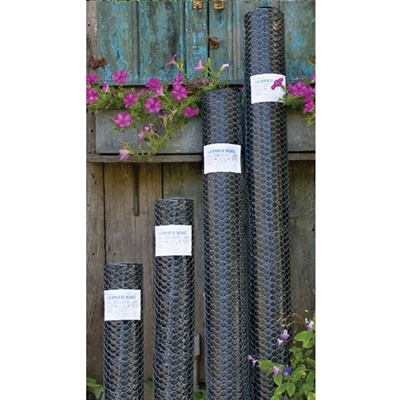 Constructed out of double galvanized twenty gauge metal, the wire rolls can last from 6-10 years and are available in different sizes, allowing the material to conform to nearly every landscape application. You can make use of the smaller single-plant wire baskets in areas where plants are not planted closely together where a rolled material would provide more coverage than needed. The baskets are constructed of the same durable material as the rolls. They can also be re-used and stored flatly for whenever you decide to re-plant. Aside from protecting agains gopher invasion, the material also is effective agains voles and moles as well. Now you can finally stop all those burrowing critters and gophers that continue to damage all your plant roots! If utilized in your landscape you will realize that the use of a wire barrier is essential in the protection of your plants from gophers. As mentioned above, gophers can cause significant damage not only residential landscapes but also cause havoc on a large scale in settings such as commercial lawns, orchards, athletic fields, nurseries, public areas and golf courses. One of these signs of gopher damage is loads of the fresh soil that dots the surface of the ground. It is assumed by many that when you see a significant number of mounds that many gophers are involved, which isn't necessary the case. A single gopher can create a large number of mounds in a signle day causing a great amount of landscape damage. This damage can interfere with lawn mowing which is an annoyance on a residential level and a major problem and potential significant expense when in a setting such as a golf course. Apart from the inconvenience, the mounds may have a huge impact to the overall look of the lawn. Gophers are particularly attracted to areas such as vegetable gardens ornamental gardens, lawns and flower beds. They make a diet of small trees, shrubs, vines, vegetables and ornamental plants. During their digging activity, you may notice that the plastic water lines and lawn sprinkler systems are becoming damaged and sometimes gnawed off completely. Even artificial grass is susceptible to gophers and it is recommended that the wire is installed below the grass to stop the gophers from popping up in the middle and damaging your new investment. Gopher wire is the best way of combating the costly and destructive impact associated with living in an area prone to gopher intrusion. As mentioned, they are often the reason why grass surfaces are destroyed. 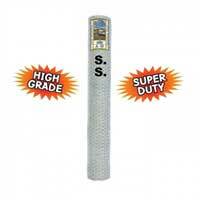 It is specifically designed to combat gopher intrusion and even though they may appear similar to chicken wire, the difference is that the latter does not go through the process of dip galvanization. In fact, a lot of people are using hardware cloth incorrectly as a barrier. This is another welded product to purchase on the market that goes through the process of an inferior galvanization process and is not suitable for effective gopher protection. The wire is a hexagonal wire mesh which a measures of ¾ across the hexagon flats The strand is twenty-gauge and goes through the process of galvanization. The material is also woven which helps it to be resistant on corrosion.